J. Crew Factory has had some amazing sales over the past few months! When I snagged with adorable puffer vest for $30, I was psyched! 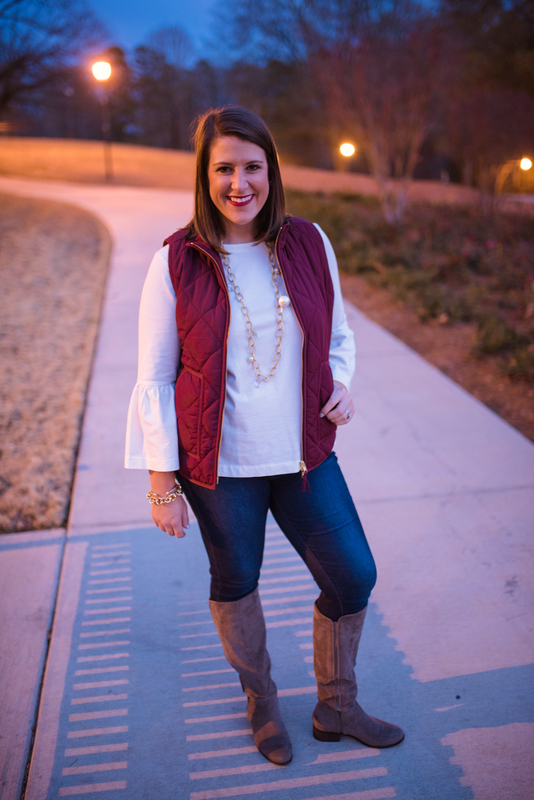 I love a good vest for almost any occasion: tailgating, going to the farmer’s market, or even layering with a dress for a more casual work day. I love the quilted detail and the pockets! They fit an iPhone perfectly and you don’t have to worry about it falling out. I know these photos look a little different than what I normally post. Alyssa and I shot these as the sun was setting and I absolutely love the way they turned out. The light looks magical and I just love the shadows. I hope y’all love them too!